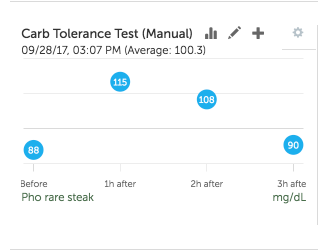 The Carb Tolerance Test is a powerful tool from Heads Up Health that anyone can use to optimize their health. By helping you test and identify foods that are optimal for your own body’s blood sugar levels, the Carb Tolerance Test can help you fine tune and customize your diet for optimal blood sugar control. Heads Up Health is uniquely designed to help you track your Carb Tolerance Test results alongside all of your other vital health metrics including lab test results, sleep, exercise, ketones and much more. Start your free trial today using the button below. Or, read on to learn more about how to use the Carb Tolerance Test on your journey to optimal health. Why Do We Need To Test? 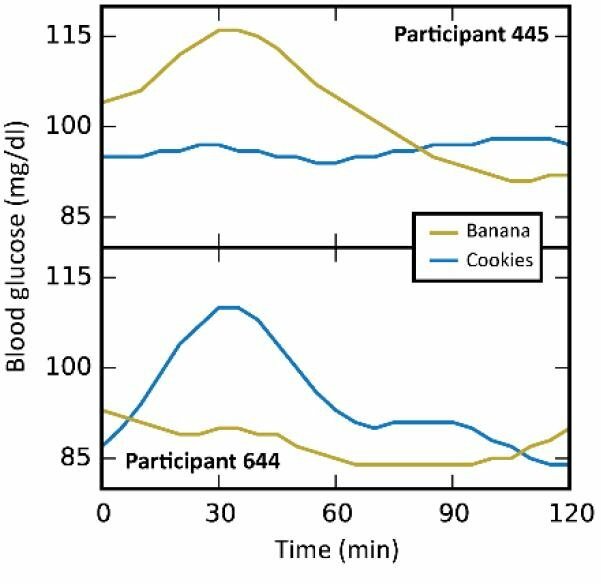 Two individuals had completely opposite blood sugar responses to the exact same foods (bananas and cookies in this case). How is this possible? The glycemic index tells us the blood sugar effects of a banana should be relatively consistent across individuals. The American Diabetes Association says we should be able to predict glucose response based on the carbohydrate content of the food in question. This doesn’t jive with the hard data from the study referenced above. Clearly there is more to the story here! Turns out that our own unique post-prandial (i.e. after consuming food) glucose response (PPGR) to a given food is highly individualized and driven by many factors including age, genetics, level of physical activity, body composition (lean mass, fat mass etc. ), stress, sleep and even the composition of our gut bacteria! This makes the process of learning which foods are best for our own unique body seem like a very complex equation! Despite this seeming complexity, there are some very simple tools we can use to study our own glucose responses and become educated and empowered to choose foods (and meals) that are optimal for our own health. Perhaps you’ve been to the doctor and taken the “Oral Glucose Tolerance Test” where you consumed a beverage containing a predefined amount of sugar and then took several blood sugar readings at defined intervals. Helpful from a diagnostic perspective but not very insightful for understanding the effects of the foods and meals we eat on a day-to-day basis. The Carb Tolerance Test is a powerful feature inside the Heads Up Health web app. You can test any food or meal, record your results and learn which foods work best for your body. You can graph your results, share them with your health practitioner and refer back to them as you make progress on your journey to optimal health. You may even discover that your body tolerates the cookies and bananas just fine! Cookies and banana aside, you may also discover you’ve been avoiding foods (or carb sources) that your body actually tolerates quite well.Conversely, you may find foods you thought were metabolically ‘safe’ actually causing a significant spike in your personal post-prandial glucose response (PPGR). Robb Wolf’s book, Wired to Eat recommends testing seven common sources of carbohydrate to see which ones work best for your own body. The results may surprise you! For more information on Robb’s recommended testing protocol, see Appendix B. You can also test complex recipes from your kitchen or your favorite restaurant meals (yes, you may need to take your glucometer to the restaurant) and learn which work best for you. For example, the image below shows my Carb Tolerance Test results after a bowl of Vietnamese Pho at my favorite neighborhood restaurant. Even with the rice noodles, my results are still very favorable and I now know can I safely enjoy this savory dish with minimal glycemic impact. The first thing you will need, if you don’t have one already, is a glucometer. 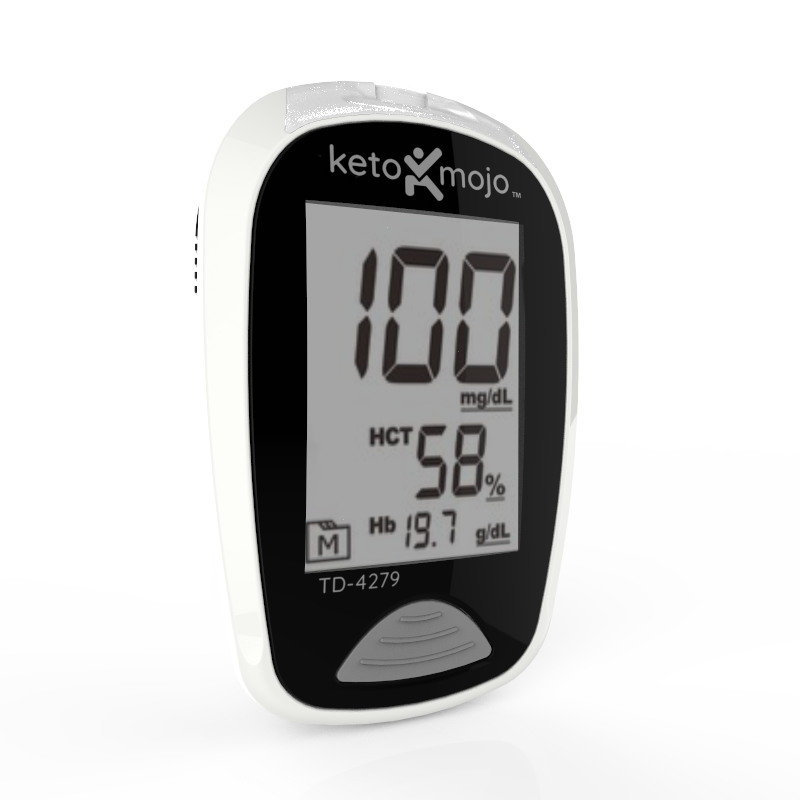 We recommend the Keto-Mojo meter because it can sync glucose AND ketones and automatically sync with Heads Up Health. Note: Heads Up Health allows you to enter glucose readings manually. You can also connect a wireless glucometer from Keto-Mojo or iHealth. 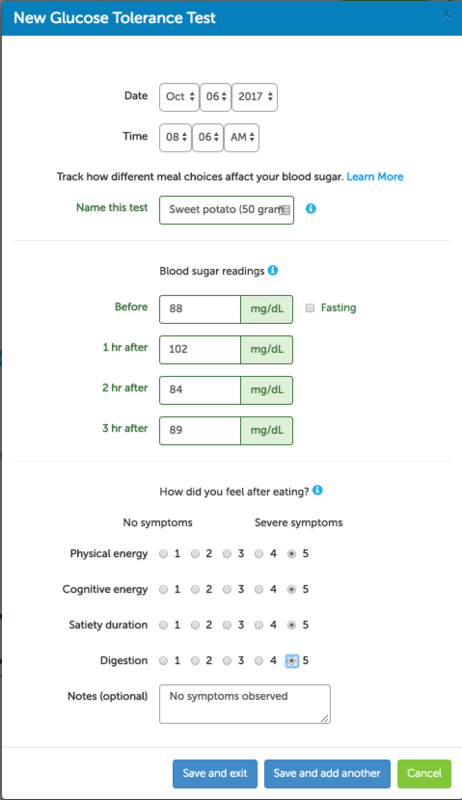 We can also automatically import your blood sugar readings from Apple Health. So choose your method and get started. For more information on tracking blood sugar readings with Heads Up, see the video below. If you don’t have one already, head over to Heads Up Health and create your account. We offer a free 30-day trial where you can test out all features, including the Carb Tolerance Test. Now for the fun part! Choose which food or meal you want to test. If you are following Robb Wolf’s 7-day carb test, pick one of the foods from Appendix B. Or simply start by testing your favorite breakfast. Start by giving the test a short name. Use the “Notes” section at the bottom of the form to add additional details on the food or meal being tested. These are the hard numbers. The actual blood sugar readings taken before and after we consume different meals. Generally speaking, we are looking at how high our blood sugar rises after a given meal and how long it takes to come back down to normal levels. Take the first blood sugar reading immediately before eating the food or meal in question. This reading provides the baseline measurement. If it’s been more than 8 hours since your last food or drink (excluding water), check the box to tag the reading as a “Fasting” reading. One hour after you started eating, take your next measurement. At this stage, your body is converting the food you ate into glucose and your reading will rise accordingly. Take note of how high your glucose has risen from the baseline measurement. Your mileage will vary here depending on your own personal metabolic health/dysfunction but in general, aim for a 2-hour reading below 140 mg/dL (7.8 mmol/L) and optimally below 120 mg/dL (6.7 mmol/L). Note: If you forget to take all the other readings on the Carb Tolerance Test, make sure you get this one. The 2-hour reading is the most commonly used for assessing post-prandial blood sugar. At the 3-hour mark, levels should have started coming down and approaching the pre-meal reading. If your levels are staying elevated (or still increasing…) then you should definitely consider avoiding whatever it was you just ate. In addition to the ‘hard numbers’ discussed above, monitoring how you feel is another excellent way to learn which foods work for you. High quality, nutrient dense food sources that support healthy PPGR are like high octane fuel for your brain. Poor quality, nutrient poor foods that spike PPGR can leave you with brain fog and poor cognitive performance. Much like cognitive energy, notice your physical energy levels after different meal choices. Do you feel like you need a nap two hours after eating? That’s a sure fire sign of a carb-crash. As you make the switch to foods that support healthy PPGR, you will gradually start to notice reduced symptoms of fatigue and steady energy levels all day long. You will likely even start sleeping better, which will mean more physical and cognitive energy. Certain foods, particularly those high in preservatives, artificial colorings, flavorings and inflammatory compounds such as gluten (gliadin) may cause digestive issues. Symptoms may include excessive gas in the form of belching and/or flatulence and unhealthy bowel movements. Refer to the Bristol score for more information on assessing bowel movement after a given meal. Simply put – how long before you feel hungry again? Finding nutrient dense foods that support stable PPGR and keep us feeling full and satiated is the ideal scenario. You may see an optimal blood sugar response on your glucometer from a given meal, but if it’s accompanied by gas, bloating and brain fog, you may need to avoid this food due to food allergy or sensitivity. That’s why its important to pay attention to the subjective measurements in addition to the actual hard data from the glucometer. Note: If you are working with a healthcare professional, they may also be very interested in seeing your glycemic response to different foods. You can invite your healthcare professional to access your Heads Up profile using the Care Team Access feature. It’s wise to re-test foods every few months. Our blood sugar response to different foods can change as our body composition, gut microbiome, stress levels, age and other elements of our health evolve. Having your results stored within Heads Up will allow you to refer back to your readings as you retest. New studies are showing that post-prandial glucose response is highly unique to each individual. The best, and perhaps the only way, to learn which foods work best for you is through your own individualized testing. The Carb Tolerance Test from Heads Up Health can help you accomplish this testing. Lowering blood sugar with the help of the Carb Tolerance Test can help you sleep better, lose weight, increase your physical and mental performance, improve digestion and manage a wide range of chronic conditions. Start by testing your favorite breakfast and go from there! If you have questions, shoot us an e-mail or post a comment here. We will respond ASAP. Robb recommends a 7-day carb test to see which sources are best suited to your own body. For each of the following, dole out a portion equivalent to a 50 gram carbohydrate load. The numbers in parentheses next to each food can be used to estimate the amount required to reach 50 grams of carbs from each source. Robb recommends conducting this test after fasting for at least 8 hours. Typically this means testing first thing in the morning where the food in question is the first thing you eat for the day. 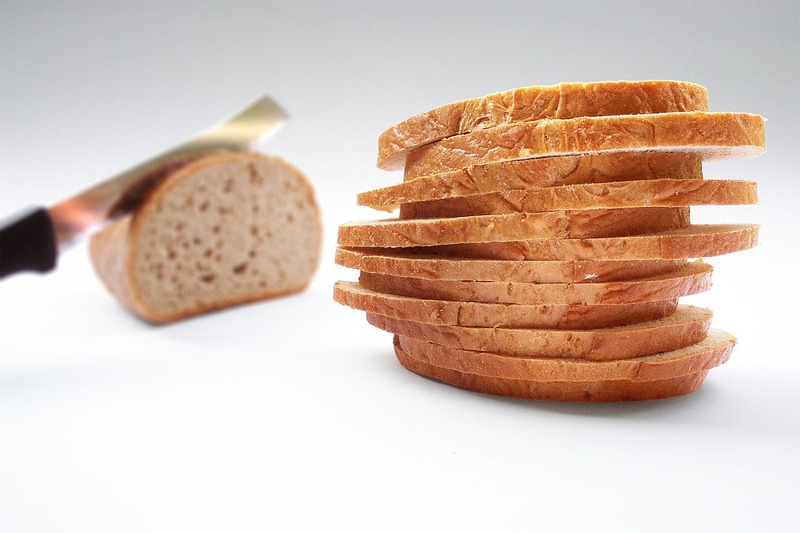 Although he only recommends testing at the 2-hour mark, you can use the Carb Tolerance Test to gather additional measurements, including the subjective variables.